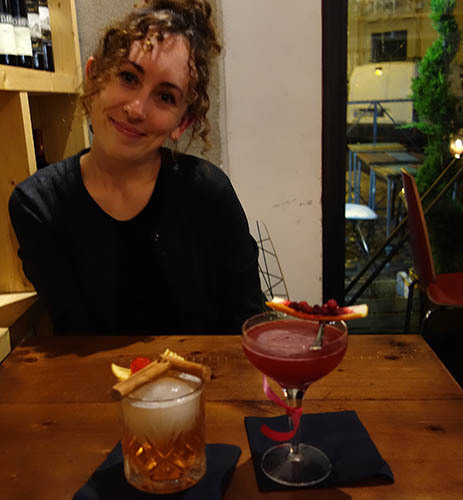 After our very busy day surveying the ruins of Rome, we took a slower day to meander around the city – a day that it rained, so we mostly wandered between museums and cafes. The day started by moving to our new AirBnB location, a wonderful back room rented from a German artist. 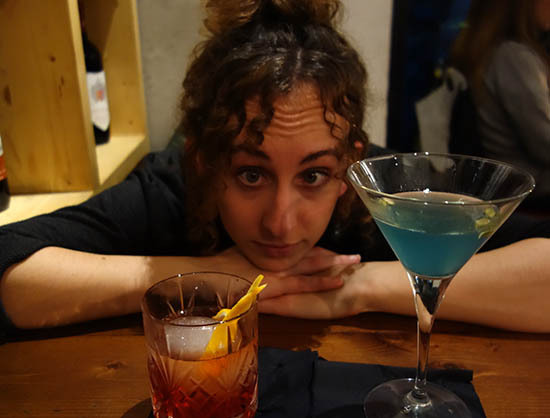 We’d wanted to split our time in Rome between two places, because we weren’t sure whether one of them would be noisy or otherwise problematic, and didn’t want our whole stay to be ruined. This street was really cute, and there were a ton of nice restaurants and coffeeshops nearby. The front was a combined studio and gallery, but the back room was private and quiet. The holes in the theatre were created during the middle ages, as locals drilled for iron that bound the stones together. Settled in, we left Trastevere. We hadn’t spent much time on the west bank of the main city, and during some wandering around, we found a peculiar ruin: the Teatro di Marcello. The cool thing about this building was that the bottom, Roman, layer, had a brick layer of apartments right on top. A neat place to rent. Back in the main forum area, we got caught in some heavy rain and took shelter inside the huge Vittorio Emanuele II monument, which is also a WWI museum, and which has a cafe with great views on top. When the rain let up, we went across the street to Trajan’s Market, a museum in a large multi-story complex of ruins reputed to be the world’s first shopping mall. To be honest, the museum was pretty lacking – the rooms incoherent, no clear plan. But the building was ancient, with dramatic views from the top. Everything here is so close – churches, ruins, monuments. 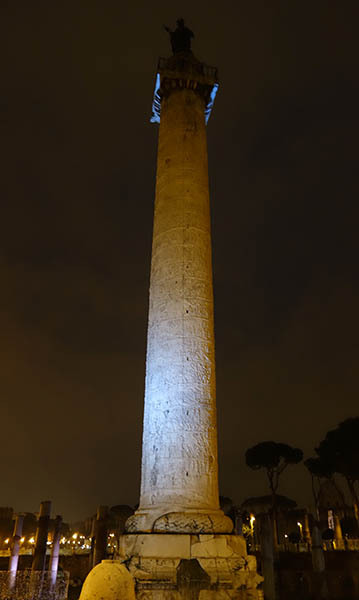 We saw Trajan’s Column (we’d walked past it a few times). I vividly remember learning about it in 7th grade history, but it’s a shame you can’t get close enough to get a good look at the reliefs. Our final stop was way far out, past the Circus Maximus: the Baths of Caracalla. It was actually really late by the time we got there, and the baths were closed. But we could go around the walls, the most imposing Roman structure that we saw. 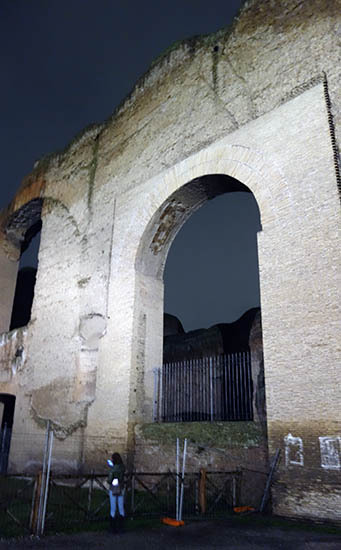 The complex, built by the cruel emperor Caracalla around 200, was the second largest set of baths in Rome. They were so large that they took 6 years to build – requiring the transport of 2,000 tons of material for every single day of those 6 years. That’s impressive. We got a bit lost at this point, in the pouring rain, but we made it back to our apartment. 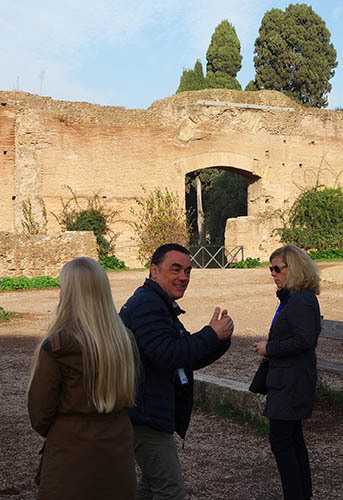 The next day, we’d visit what was, for me, the highlight of our trip: Ostia Antica. This entry was posted in Italy on February 10, 2015 by rob. Before leaving for Italy, Alex and I had talked about taking a few tours. 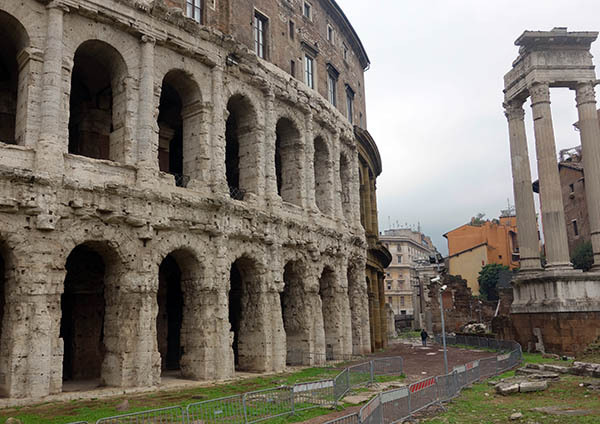 We’d signed up for the one in Tuscany, but I’d also signed up for a surprise tour – one of the Colosseum and Palatine. I suspected that these sights wouldn’t be a great experience on their own, because without any context, it’s just a lot of ruins. The downside was the we had to wake up early, but we got a good view of the triangle marked off by the Colosseum, forum and Palatine hill while it was quiet, without too many non-commuter crowds. We met at the subway/bus stop outside the Colosseum; our tour group was about 10 people, all American except for a Malaysian couple. Our guide was a very energetic Rome native (one who had strong opinions about Italian government). The Colosseum is now a Christian holy sight, because there’s a legend that Christians were persecuted there. The first stop was the Colosseum. You see a lot of pictures of the Colosseum, and digital representations in movies like Gladiator, but I guess I’d never really tried to visualize what it would be like. It managed to be both bigger and smaller than I expected. Bigger, because the outside really dominates the area around it. Smaller, because the inside was cozier than i expected (even though it was large). It felt smaller than the Colosseum represented in Gladiator. 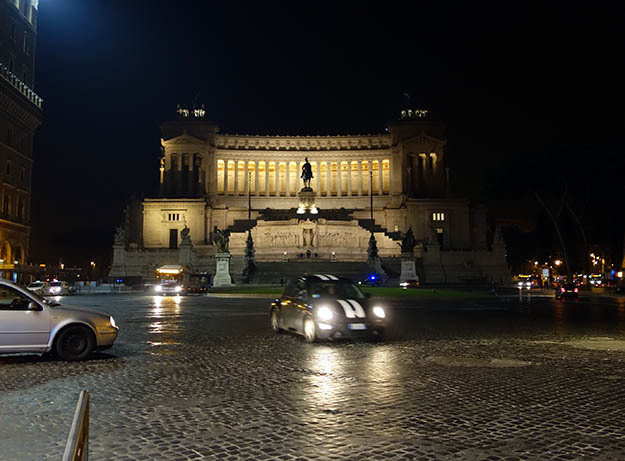 First off, the Colosseum is in the middle of a traffic circle. There really aren’t any stores or restaurants or apartments nearby, just a busy street and a lot of ruins. The inside is raw: there’s a small section with reproduction flooring and sand, but most is in an un-reconstructed state. It works great as a museum, and to visualize what sort of hell it must have been in the corridors underneath the floor. But, on the other hand, it’s difficult to imagine what the Colosseum would have looked like in its heyday. This was in contrast to the arena in Verona, which is still in use. 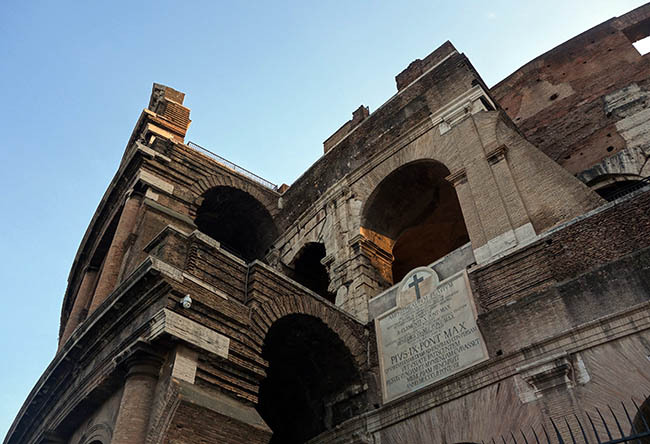 From the Colosseum, it’s a short walk to the Palatine. This was one of my favorite spots in Rome. It functions as a sort of giant park, but also a huge archaeological site. 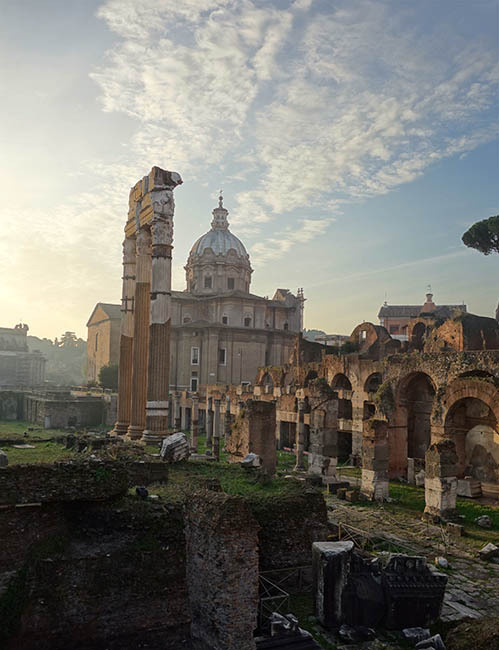 The Palatine hill is one of the famous seven hills of Rome, and the one that was used as a residence for the Roman emperors (due in part to its proximity to the forums). From the word ‘Palatine,’ we get the English word ‘palace’ (Italian: ‘palazzo’). It’s a peaceful place, quiet, with a lot of interesting views (after all, it’s on a hill). 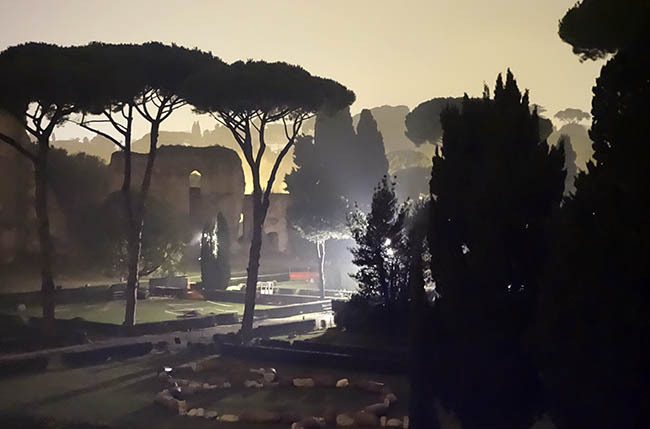 You can see the Circus Maximus, the Colosseum, and even the Vatican, from various locations. Two sights in particular stuck out for me. First, there’s a small section of the throne room. It’s not something that you often hear about, if you read about Rome. It just somehow escapes notice. But of course, there must have been at least one throne room, and in fact, it’s possible to stand in the location where the throne was located. That was very cool to me, picturing Marcus Aurelius or Trajan in the same spot where I stood. Romulus’ hut. You can see holes from where the poles were dug. Second, there’s a claustrophobic group of stone ruins on the far side of the Palatine, covered with an aluminium roof. 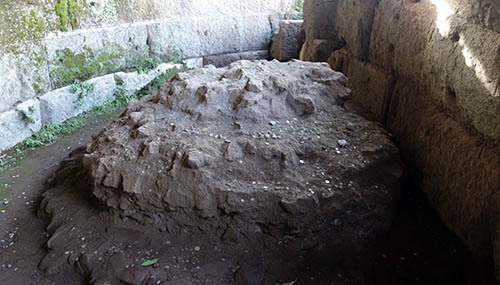 This was the mythical hut of Romulus, the founder of Rome. The hut was diligently maintained by the ancient Romans. 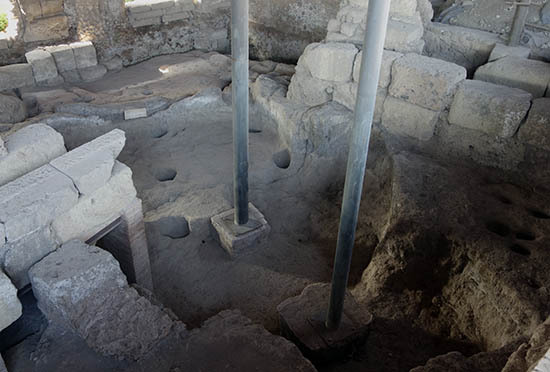 Although the founding of Rome is shrouded in myth, archaeologists believe this was inhabited around the time that Rome was founded, or maybe by the Etruscans before. I loved seeing a spot that the Romans considered so important. After the sack of Rome, Visigoths unsuccessfully attempted to pull down these columns (you can see where the chains dug into the stone). Those coming after the Roman empire couldn’t even destroy what the Romans had built. Heading down from the hill, we got an inside view of one section of the forum (half of the forum requires an entry fee; the other half is free. The forum is bisected by a huge road constructed by Mussolini). It’s simply impossible to visualize what this area looked like at any point in time. There’s structures at various heights and from various periods, in all sorts of disarray. 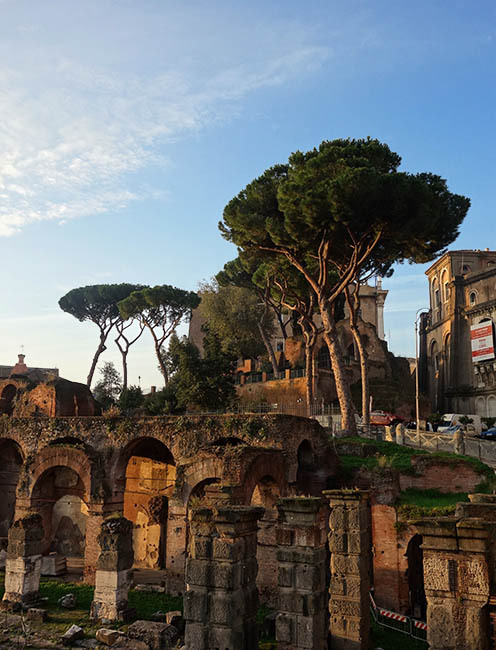 During the middle ages, this area was deserted, and silted over when the Tiber flooded; herds of animals grazed here while the population of the depleted city lived across the river, near the Vatican. 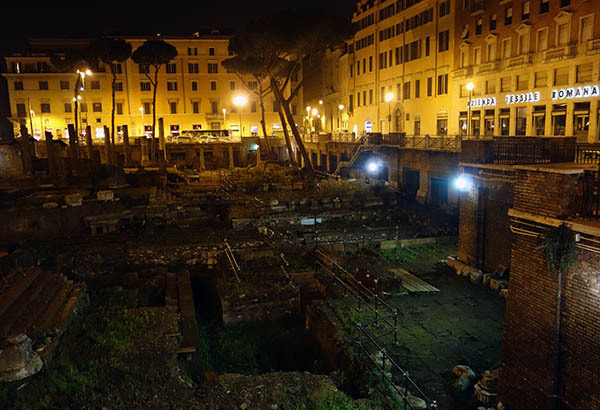 Two more sites of interest in this area were the mound where Julius Caesar’s body was burned (the mound is still visible – people throw coins on it for good luck). Also, there’s a prominent nearby location where Mark Antony gave a speech to the people of Rome. After leaving the Palatine hill, we grabbed a quick lunch (more pizza for me), before taking a walk to the Pantheon. We’d seen the outside, at night, but now it was time to check out the inside. 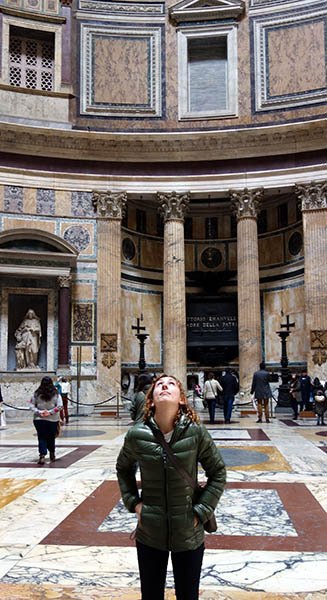 The Pantheon is widely known as one of the architectural marvels of the world. The inside is basically a huge poured-concrete dome with an open center to provide light. The dome was great – but of course they’re relatively common these days. More exciting to me, was a chance to get a look inside one of the best-preserved Roman buildings in the world. 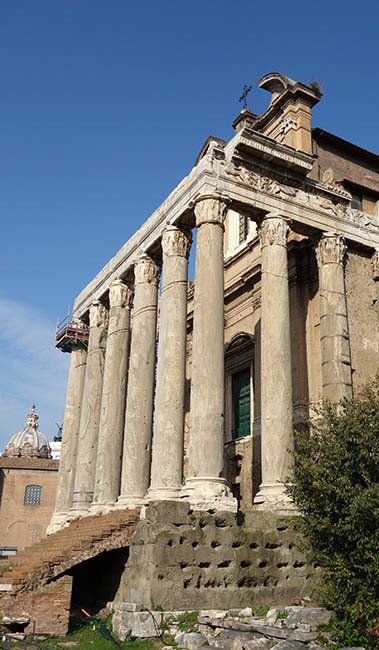 The Romans employed a huge variety of marbles in their construction (something we’d seen around the other ruins), and the Pantheon was preserved mostly intact as a Christian church. Just around the corner is a great coffee shop: Tazza d’Oro (Gold Cup). 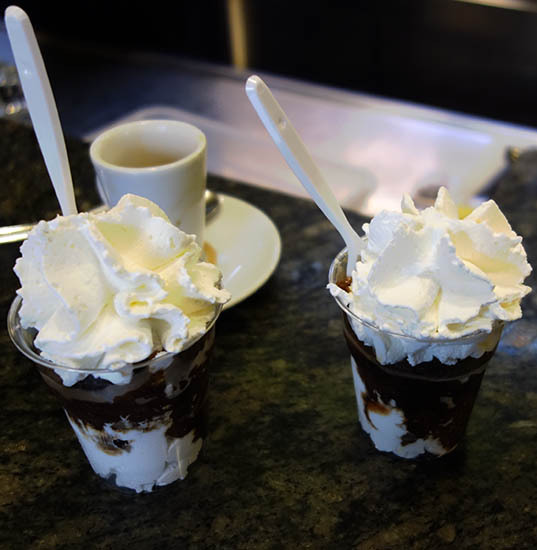 I’d read they had great granita, and this was one of the food highlights of our trip. Granitas are like a layer cake, where the layers are crystallized espresso and whipped cream. The coffee flavor was just incredibly intense, but balanced out by the sweetness of it all. Really strong! 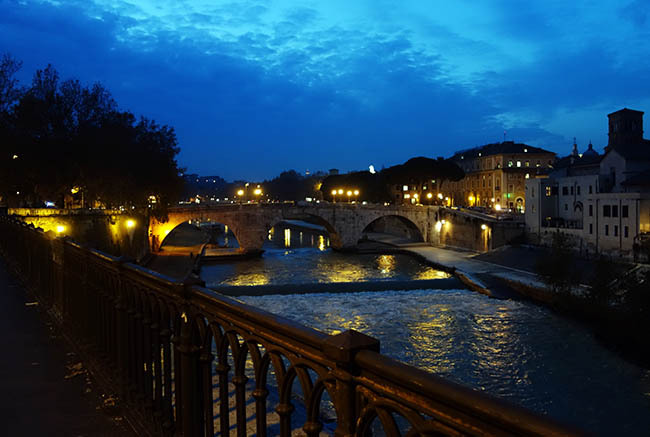 Next, we crossed the Tiber and walked around the parks there – seeing, among other things, miniature horses, parrots, the Vatican, memorials to Italian independence, the Spanish consulate, and a merry-go-round. 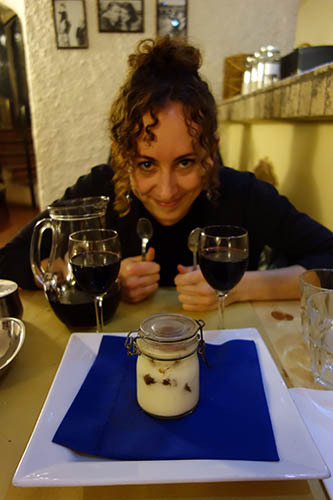 After dinner (generic Italian food; tiramisu), we stopped at a fancy bar. They served all sorts of mixed drinks and cocktails. We had several rounds. We started on the menu, but one of the bartenders came over to take our order for the next round. “Do you have any suggestions from the menu?” we asked. “I wrote the menu.” So, we let him choose for us. For several rounds. I think he was trying out some new drinks that were off-menu. There were at least three amazing drinks: a mint julep with Saint Germain, a cinnamon rum drink, and a lemon daquiri. There were some other tasty drinks, but these were absolutely amazing. 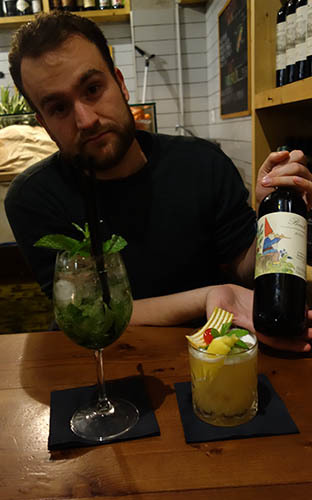 We agreed that our bartender was a genius. And had quite a bit to drink. When we left the bar, there was a crowd of maybe 10 people outside, drinks raised, clustered around the bartender, who was giving some sort of speech. Cheers! This entry was posted in Italy on February 9, 2015 by rob. To travel from Lucca to Rome by train takes about 4 hours. The train goes through Pisa and then along the Mediterranean coast for some distance, before veering inland. Your mental image of Italy might be a flat plain, but much of the country is hilly or mountainous (not ‘mountains’ in the sense of the Rockies or Andes, but at least rocky enough not to be arable. In some sense, Rome was the reason we chose to visit Italy. After all, it was the history of the Roman Empire and Republic that drove much of their history (and the part of Italy’s history that was most innately interesting to me was that of the Roman Republic and Empire, not the Renaissance). And Rome is one of the greatest cities in the world, standing right alongside New York, London and Tokyo. 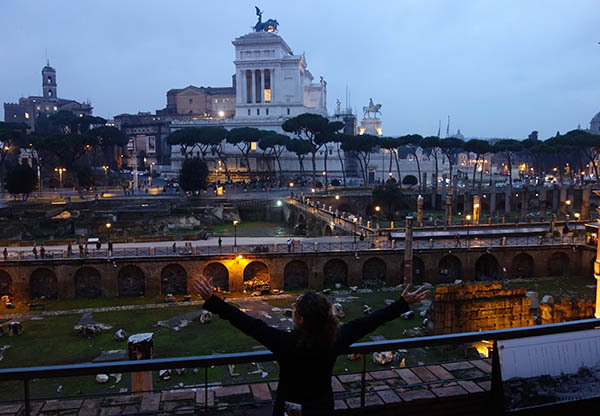 We’d scheduled almost half of our trip (6 days) in Rome and the surrounding areas. Now, leaving Lucca, we sped towards the eternal city. 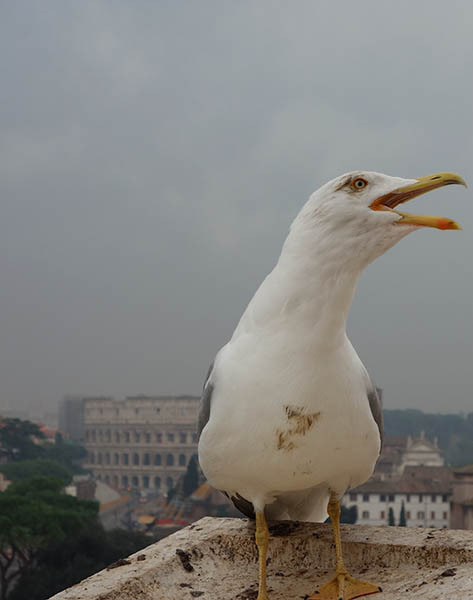 What of the physical geography of Rome? We couldn’t even begin to see all of Rome in a single visit, but stayed in a few major sections. 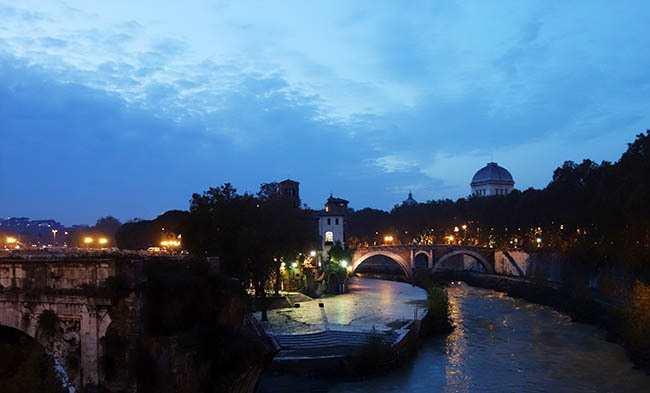 Overall, Rome is divided into rough Eastern and Western halves by the Tiber river. The bulk of the city lies on the Eastern half, including the old city, which contains many of the most prominent ruins (as well as being the tourist district). This part of the city inludes the Pantheon, Trevi Fountain, and Spanish Steps, along with lots of fancy shops and museums. 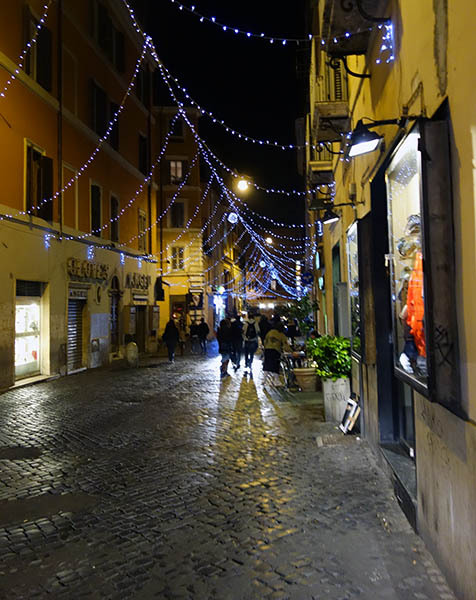 We stayed at two AirBnBs in the southwestern part of the city, in the district of Trastevere. 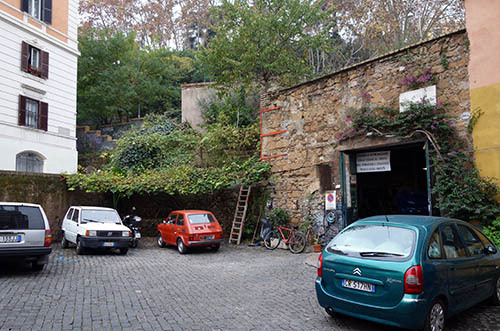 This was described to us as the “Roman Brooklyn,” a somewhat less visited artistic district with more community, winding streets, vines on the buildings. The northwest of Rome is separated from Trastevere by a longish park and hill; the whole area is dominated by the Vatican, and there are a great many priests and nuns on the streets. In terms of feel, Rome was totally distinct from other cities. It is, after all, a city that has been continuously occupied for over 2500 years, and which was the dominant city in the western world for much of that time. Because of this, there are a ton of layers. Many buildings are half Roman Empire, half modern office building. Apparently Freud had some deep fear of the layers in Roman cities – of all the things that had happened under his feet. If you suffer from OCD and want a clean, orderly city, avert your eyes. 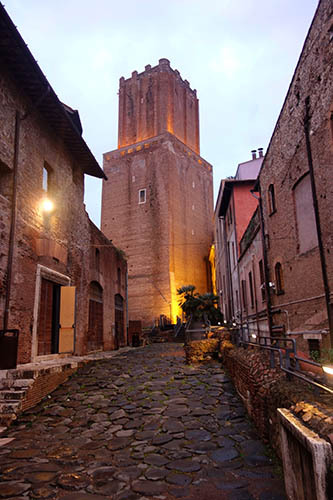 To make matters worse, in stark contrast to every other Roman city, the streets are very disorderly throughout the city. This is because the city was sacked by barbarians very early in the history of the Roman Republic, and the Romans – only one of many powerful Italian groups – rebuilt very quickly. In contrast, most other Roman cities were based on army garrisons, which were laid out in incredibly strict grids. 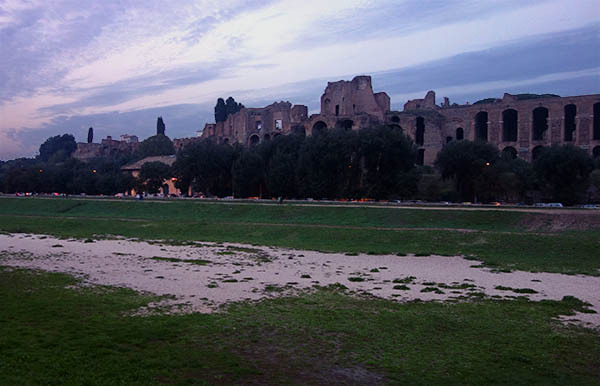 The Circus Maximus – now basically an empty field. Arriving in Rome, we passed through the Circus Maximus and crossed over the Tiber, making a beeline for our first AirBnB location. This was on a very busy street, bookended by playgrounds and with lots of people. It felt like one of the outer burroughs of NYC… so a bit like Brooklyn. We had a real moment of horror trying to find the building, before realizing that streets in Rome are numbered so that one side increases and the other decreases – like Boustrophedon (at least, this one was). After dropping off our bags, we went out to take a look around. At this point I had some waking nightmare that the Pantheon, which had stood for two thousand years, would somehow collapse before we arrived. Thankfully, it was still standing. 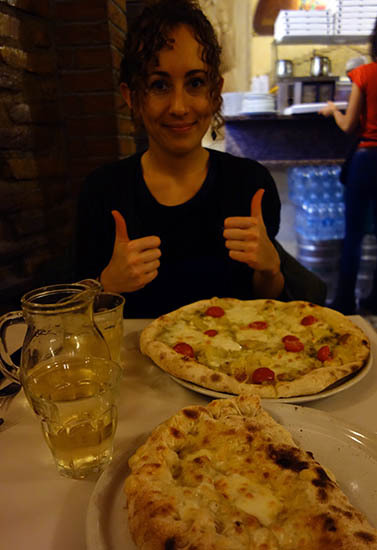 Our first mission was to eat, and we found a spectacular pizza place nearby on a little side street. We got a pesto pizza and Alex’s first calzone. This was undoubtedly my favorite pizza place of the 6-7 we tried in Italy – and it had some stiff competition. The crust was great, and there was a ton of cheese and tasty toppings including cherry tomatoes and potato. We’d return towards the end of our stay for an even better meal. Next, totally bloated and overwhelmed, we crossed the Tiber to check out the old city. It’s relatively compact, and there’s a few major sights in this area: the Pantheon, the Trevi Fountain, and the Spanish steps. Although the sights were pretty, the only one that I really loved was the Pantheon (and it’s the inside that’s impressive – it was closed at night). To me, this area felt impersonal and really seemed to cater to wealthy Americans looking to live it up in fancy hotels. But it was nice to see at night while it was quiet out. 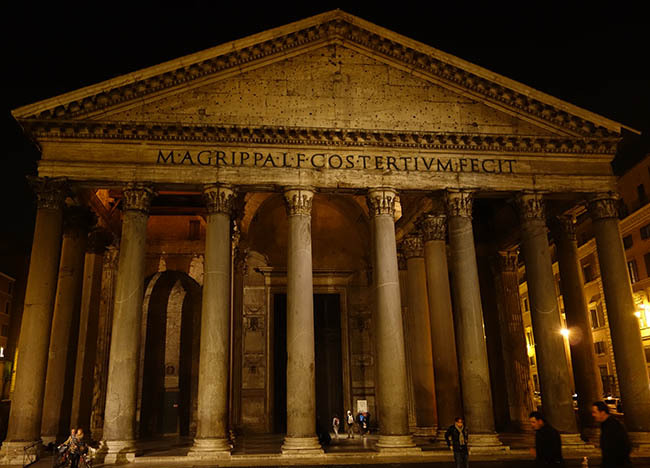 We ended up visiting the Pantheon three times: at night, during the day, and during rain. It was accessible and near where we were staying. That first night, it wasn’t very impressive. Next, we headed to the Trevi Fountain. Thankfully, we knew in advance that it was closed, and basically the entire face was covered in scaffolding. It hadn’t been on my ‘to-see’ list anyway, but it was between the Pantheon and Spanish Steps. 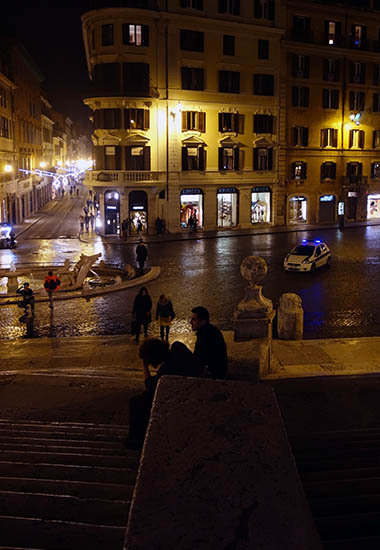 The Spanish Steps were pretty overwhelming… as far as steps go. We sat around in this area for a while. Even late at night, it was overwhelmed with hawkers trying to shove roses at us face, or little rubber band helicopters. 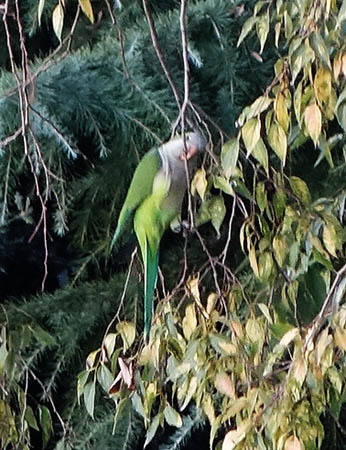 While we were sitting on the third flight of stairs, two guys showed up one flight below us. With bongos. I’m not a huge fan of bongos. I don’t think many people are. And this guy wasn’t particularly good, just a hippy-type looking to make noise. His friend say next to him and watched him play. Thus, it was perhaps the highlight of the night when a police car showed up and a cop got out and told the guy to shut up. The bongo-ing stopped, and cop went back to the car. It was clear the bongo guy was just waiting for the cop to leave, and the cop was staying. This Mexican standoff continued for the duration of time we were at the steps, which was quite a while. After that, exhausted from wandering around, we wandered back to the apartment to get enough sleep for another busy day in Rome. This entry was posted in Italy on February 8, 2015 by rob.